Vegetables are an important part of a healthy diet. 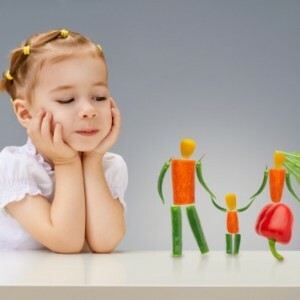 So, how do you get your kids to eat their veggies without a fight? Try it the SuperKid Nutrition way! This mild-tasting vegetable can be mixed into dozens of sauces and meals without anyone knowing the difference! Since it is white, it is easier to camouflage. Wash, chop, and steam the cauliflower until soft, then puree it in a blender or food processor. Try stirring it into a cheese sauce for a healthier version of mac n’ cheese, substitute or add it to mashed potatoes for an added nutrition boost, or mix it into a soup to make it thicker, creamier, and healthier. Cauliflower is a member of the cruciferous vegetable family, which is well known for its cancer-fighting properties. Next time you make pesto, replace some of the basil with spinach or kale leaves. Use this pesto recipe as a base than modify by replacing some of the basil or olives with other vegetables. You’ll still get all the goodness of pesto, with an added boost from the leafy greens. Place the spinach or kale, along with the basil, garlic, and pine nuts, into a food processor. Pulse until coarsely chopped. Add any seasonings you may enjoy like salt, pepper, lemon, or parmesan and pulse again. Leave the food processor running and add olive oil slowly until a thick paste forms. Voila! Delicious healthy pesto. Mix the pesto with cooked whole grain pasta, spread on a vegetable sandwich, or use on a homemade pizza. The best part? No one will even notice the nutritional punch they’re getting in their beloved pesto. Instead of using whole wheat pasta noodles, make your own “noodles” out of vegetables! Try shredding zucchini and yellow squash lengthwise with a grater, mandolin, or spiral vegetable slicer, quickly blanch, and use in place of cooked pasta. Cooked spaghetti squash can be shredded with a fork to create angel hair “pasta”. Top with marinara sauce, basil, olives, and cheese for a tasty treat. These delicious “vegoodles” are not only as good as pasta, but they are also loaded with good nutrition and will help meet your children’s fiber needs. Finely chopped or pureed mushrooms, onions, carrots, or zucchini can easily be disguised in meatballs or hamburgers patties. First, sauté the vegetables in a little olive oil so they are soft. Next, mix the vegetables with the lean ground meat. Add an egg and whatever seasonings you prefer. Shape the meat mixture into meatballs or hamburger patties and cook as you normally would. Serve covered in sauce or on a bun with the usual condiments. The only thing your kids will notice is how tasty the meat is, and without realizing it, they’ll be getting a variety of vitamins and minerals that are normally lacking in a typical meatball or burger. 5) Try a green smoothie! Combine white, yellow, and green fruits such as apples, pineapple, and/or bananas with leafy greens like spinach or kale, and some milk (cow, soy, nut, or coconut all work) and blend until smooth. The resulting smoothie will be a delightful green color, taste like fruit, and sneak in at least a cup of leafy greens per serving. Give it a fun name, like “Dino Juice” and your kids will be asking for it at snack time. 1. 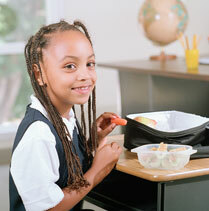 How many servings of vegetables should kids have every day? 2. True or False: Most Americans meet the recommended vegetable intake. 3. What health benefits do vegetables provide? 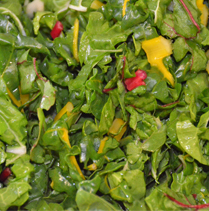 Vegetables provide many vitamins, minerals, and phytochemicals. They help protect against coronary heart disease, cancer, and diabetes. Elana is a graduate student studying human nutrition at Drexel University in Philadelphia. She is also the author of the blog The Inventive Vegetarian where she shares tasty and healthy recipes. Elana is working towards becoming a registered dietitian and plans on specializing in pediatrics.